The first PlanetS workshop in collaboration with Explainables.org, a science communication network founded by young researches from all over the world, was focused on developing communication and marketing skills for our PlanetS students and postdocs. About 20 early career scientists from first year grad students to established postdoctoral fellows from all over Switzerland met at the Center for Space and Habitability (CSH) in Bern for a one day Explainables’ “Communication, Branding and Proposal writing for Scientists” workshop. The morning session was reserved for warm-ups and improv’ exercises sprinkled with some communication 101 lecture bites, lead by Dr. Daniel Angerhausen, PlanetS affiliated CSH fellow and Co-founder of the Explainables non-profit. The first session in the afternoon was about “Branding, Marketing and Networking for Young Researchers”, and focused on techniques and best practices to position the young scholars in their field of research. Again the Explainables used a mix of lectures to illustrate the underlying concepts combined with their signature interactive exercises. For one of these exercises the participants had to quickly improvise marketing pitches for randomly generated “science products”. This time one group drew the combination of the words radio and brain and came up with an excellent impromptu sales pitch for their “brain radio”. In another of our fun hands-on activities, called “Analogy roulette”, a different group did a great job explaining the very abstract concept of Brownian motion with the help of a can of Burt’s Bee’s Wax lip balm as a prop. In the final session CSH and Ambizione Fellow Dr. Dan Bower (in his first appearance as an Explainables facilitator) focused on proposal writing – a key skill for a successful academic career. In his interactive lecture he focused on preparation, writing and evaluation of proposals including a “peer review” session, where our participants discussed and reviewed proposal and application documents of others in the group. The final feedback and wrap-up session showed that the unique hands-on approach of our Explainables workshops was very well received and each participant came up with a personal favorite exercise and lesson learned. `I did other more theoretical two-day workshops about e.g. 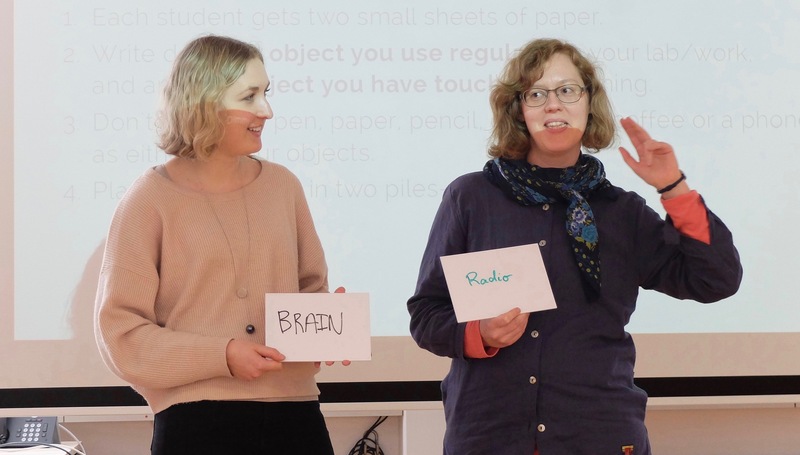 how to write a CV, and I learned more and with much more fun in your varied one-day workshop than I did in the others,´ said for example Esther Linder, Astrophysicist and PlanetS affiliated PhD student, one of the participants of the workshop. NCCR-PlanetS and Explainables are looking forward to work with this group of excellent young scientists and communicators from in the near future. "They tell us in a very direct way if something isn’t good"